Yesterday I had to take a little break from all the sewing I have been doing on Tessa’s costumes for her role as Amber in Hairspray. It’s been fun but I was ready for a little change. You know I have a thing for buying old sweaters from Goodwill. I like to turn them into skirts – like this one and this one. 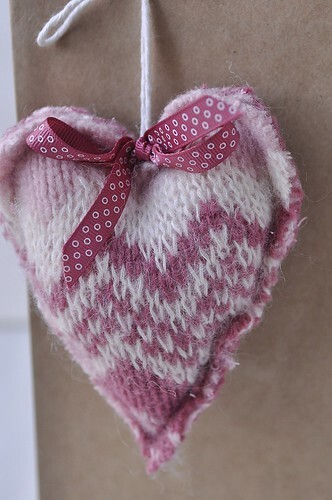 I have also been collecting sweaters for a Valentine’s project I had in mind. 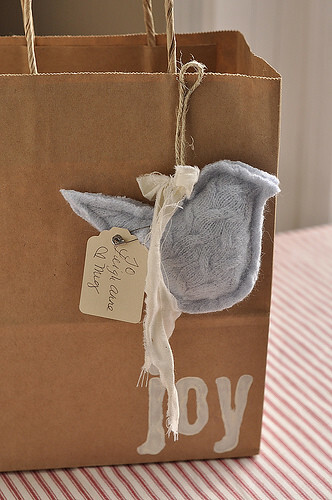 You see, I was inspired by this darling gift bag my friend Meg made and gave to me for Christmas. I wanted to make a Valentine version. 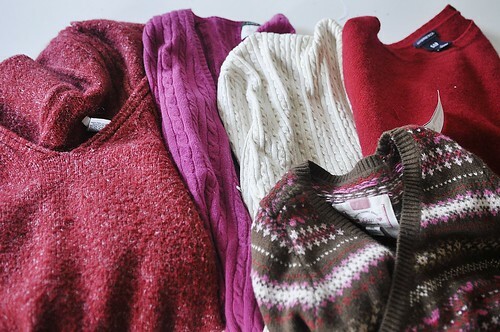 I collected a few sweaters. Depending on the size of sweater I paid between $4.00 and $7.00 dollars for each one. You want to make sure the sweaters contain wool because you are going to “felt” the sweater. 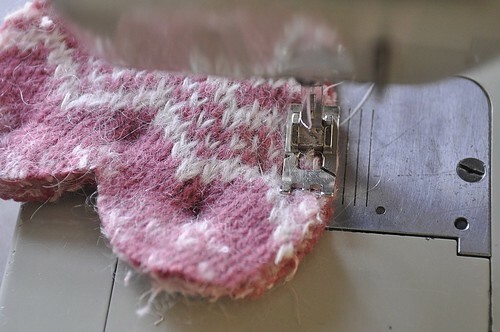 Since you are going to cut it you don’t want it to unravel and felting the sweater prevents this. Have you ever accidently put a wool sweater in the wash? If so, you know what happens. It shrinks! 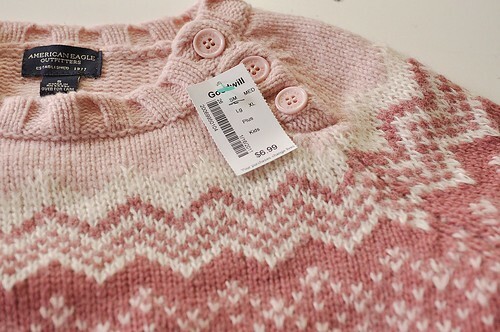 Be sure and check the tags of the sweaters to make sure they have wool in them and aren’t all cotton or acrylic. Avoid cashmere as it doesn’t felt. Lambswool felts somewhat but not as well as 100% wool. The sweaters I used were a combination of wool and nylon (it didn’t felt very well), the one in the photo was a combination of lambswool and nylon and it felted o.k. You want to look for as “virgin” a wool as you can for the best felting. …and here it is afterwards. 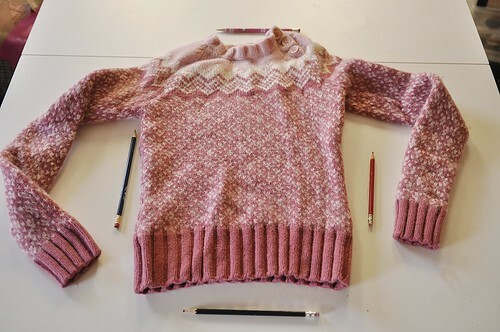 I laid pencils where the original outline of the sweater was so you could see how much it shrunk. To felt a sweater you want to wash it in hot water in your washing machine (a top loader with agitator is preferable) I borrowed my neighbors. I did wash one sweater in my front loader but just ran it through twice to help it felt a little more. Then I throw it in the dryer on high to help it shrink some more. If it hasn’t shrunk enough you could repeat the process. 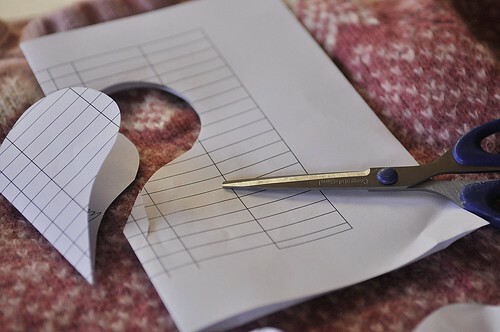 The next step is to cut out your pattern. Since it is Valentine’s Day soon I went with a heart. I just cut it free hand from some paper in the recycling bag! Any shape heart will do. Next, I like to cut the arms and neck ribbing off the sweater and open it up at the side seams so I have two flat pieces of sweater. I also open up the sleeves because there is usually enough fabric there to work with too. I loved this Fair Isle sweater and the pattern around the yoke. That’s where I cut my heart out of. I cut the backside of the heart out of the body of the sweater since I didn’t want to use up all the great pattern on the backside of the heart. 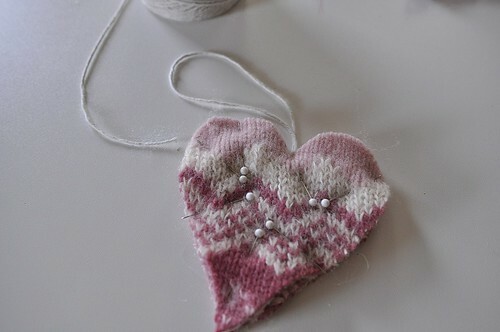 The next step is to pin the back and front of the heart together (wrong sides together). 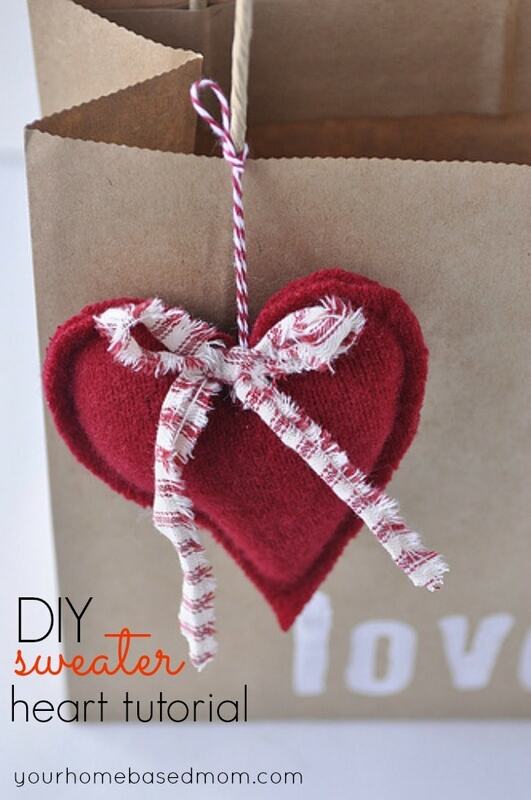 You will also want to insert a piece of string or twine to use as a hanger. 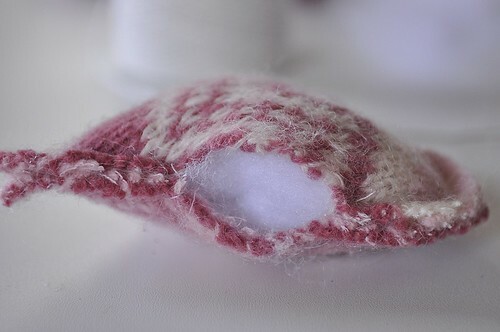 Place your presser foot along the edge of the heart (about 1/4″) and sew around the heart leaving an opening on the side of about 1 1/2″, room enough to insert the fiberfill batting. After stuffing the heart finish sewing the opening closed with the machine. 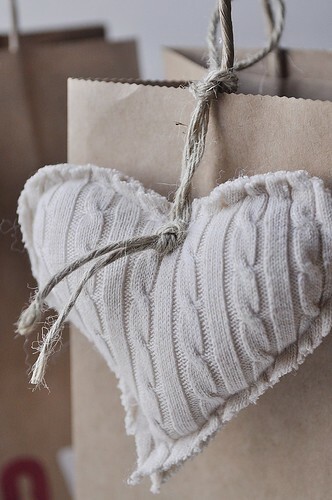 Another way to attach a string hanger that looks great is to just tie a knot in your loop and top stitch it to the outside of the heart. 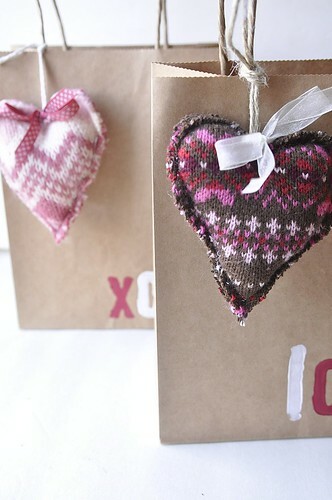 The little sweet sweater hearts make the perfect decoration for your Valentine gift bags. You can add a piece of ribbon or torn fabric as a bow to dress up the heart a bit. 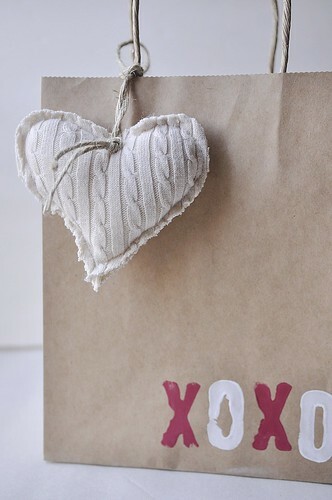 I used rubber stamps and acrylic paint to add a little love message to the bottom of the bag. This cream color heart was made out of an acrylic sweater so it didn’t felt at all, thus the frayed edges but it still works. 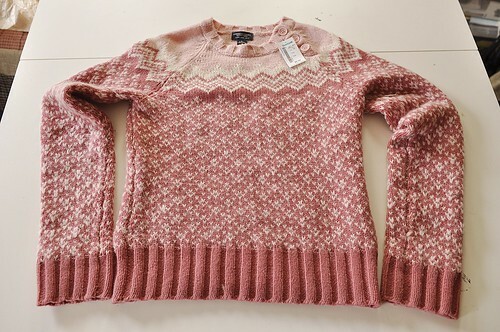 I loved the texture of the sweater. Lots of possibilities and one sweater will yield quite a few hearts. They would also like darling on a Valentine tree. 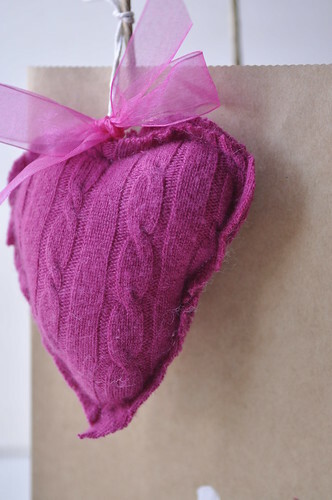 Happy sweet sweater heart sewing! I LOVE THIS! What an adorable idea. This is such a cute idea! I just got a new sewing machine for Christmas and all of your cute ideas are on my list of ‘Must Do’. I bet those hearts would be great with some lavender tucked in them. I am so grateful that you’re sharing your awesome talents because for someone like me who doesn’t have a creative bone in their body, your ideas are amazing, easy and so classy. I love it! LOVE this idea! It’s so simple, so cute, so warm and fuzzy. I’ll have to make a few. these are so cute. 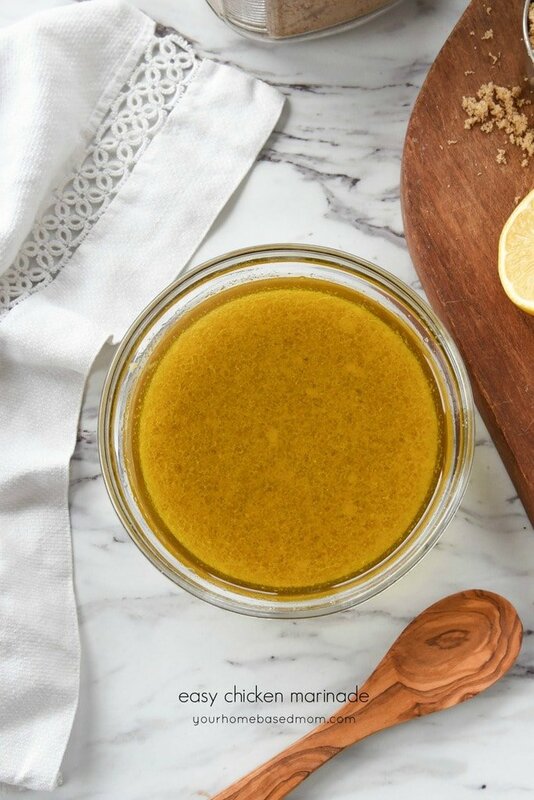 I can’t wait to try this. Now, I just have to find some sweaters. What a revelation to know that when one accidently shrinks a sweater (and I have!) 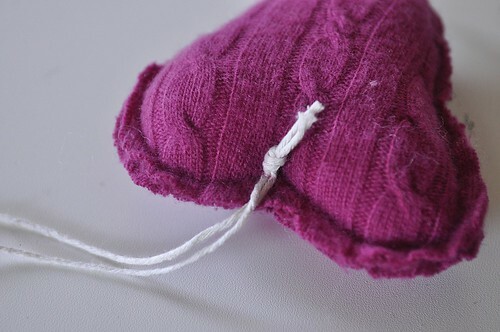 it can be used for something creative, and it even has a name…felting. Who knew! Thanks for all of your great ideas. I see a trip to Goodwill in my future..what a fun idea! Brilliant. Cute. Fabulous. Awesome. Clever! Thank you for sharing your cute, adorable ideas! What fun! Hi Leigh Ann! I’m a new follower at the MMB! Nice to meet you! 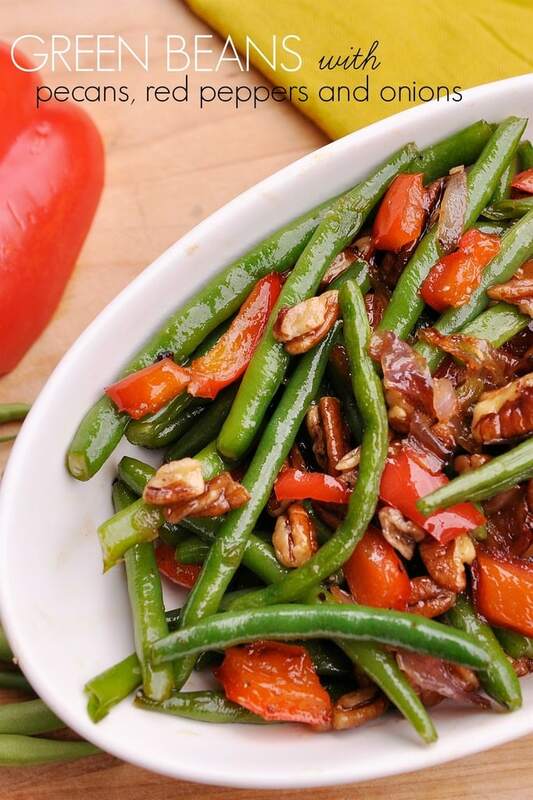 Your hearts are so stinkin’ cute! Love the hearts!! If I made them, I’d have to give Valentine’s gifts to someone other than my family. They wouldn’t appreciate the effort. Again, I want to be you when I retire. This is a fantastic idea for any holiday! I have a ton of old wool sweaters that would work great for this! Great post! one of your fans in WA!! 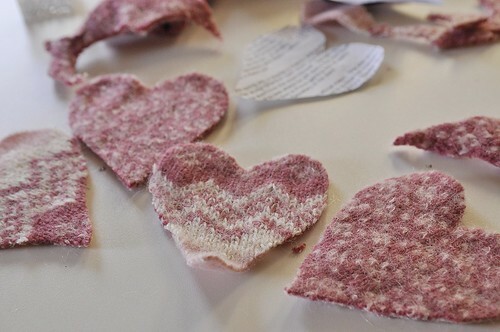 felted shapes would be handmade and so adorable for the many on my gift list. Thanks for sharing such a heart warming practical idea that’s quick too! Stephanie – it would be a perfect Christmas ornament! Such a creative idea! 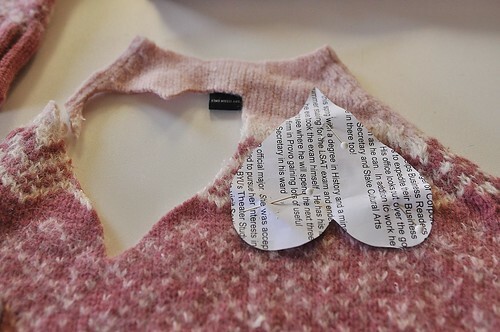 I have some sweaters that would be perfect to be recycled into hearts and birdies. I already know how I’ll wrap the Christmas presents this year. Thank you for the inspiration!